Grace Health staff raised funds to help those who have been affected by the recent hurricanes. A group of staff members (Jennifer Colberg, Melanie Gardner, Lori Wesner, and Lynne Olmstead) came up with a plan for various events staff could participate in to raise money for hurricane relief. Throughout the entire month of October staff had the opportunity to purchase raffle tickets at a chance to win 1 of 6 gift baskets. Staff paid to wear jeans on Jean Day, Friday, October 20. Not only did staff contribute financially to the cause, but they also put their baking skills to the test and made several homemade items for the Bake Sale on October 27. For every $1,000 raised, a raffle ticket was drawn giving a staff member 8-hours of PTO. All funds raised will be given to Samaritan Purse for Hurricane Relief 2017. Grace Health thanks the following community organizations for donating gift cards and/or items for the gift baskets: Finley’s, Fitness Loft, Keyes Auto Body, Minges Creek Salon & Spa, Taqueria San Francisco, Goodrich West Columbia 7 Theaters, Wirtz Family Popcorn, NCG Cinema, Barista Blues, Culvers, Fun 4 Us, Steak and Shake, Taco Bell, FYE, Sweetwaters’ Donuts, Continental Pastries & Deli, Biggby Coffee, and Lux. 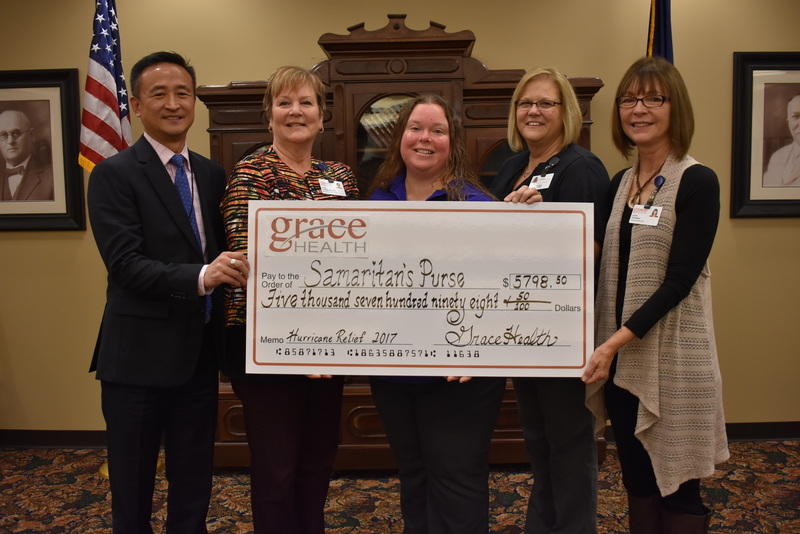 Through the kindness of these organizations and all of the efforts from Grace Health staff a total of $5,798.50 was raised. A big THANK YOU to all who helped!